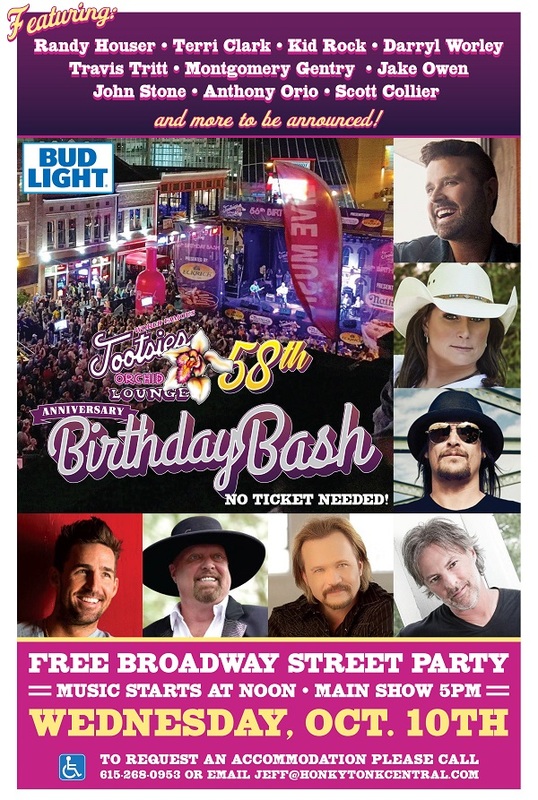 WORLD FAMOUS TOOTSIE’S ORCHID LOUNGE 58TH ANNUAL BIRTHDAY BASH SET FOR WEDNESDAY, OCTOBER 10TH | 2911 Enterprises, Inc.
Tootsie’s to feature Randy Houser, Terri Clark, Kid Rock, Jake Owen, Travis Tritt, Darryl Worley and more! Broadway Street Party in Nashville Celebrates 58th Anniversary with FREE Concert! Past Surprise Guests Include Dierks Bentley, Colt Ford, Jamey Johnson & More — You Never Know Who is Going to Drop By! ‘Ty, Kelly and Chuck Mornings’ hosts Ty Bentli, Kelly Ford and Chuck Wicks will be on hand to kick off the event with ‘NASH Nights Live’ co-hosts Shawn Parr and Elaina Smith rounding out the evening emcee duties! NASHVILLE, Tenn. — The World Famous Tootsie’s Orchid Lounge, Music City’s legendary honky-tonk, will celebrate its 58th Birthday in downtown Nashville Wednesday, October 10th. As part of the celebration, Tootsie’s Orchid Lounge will feature entertainment on the outdoor Broadway stage throughout the day with a FREE, star-studded evening concert featuring performances from Platinum-selling powerhouse Randy Houser, international superstar Kid Rock and country hitmaker Jake Owen. Hosted by Ty, Kelly and Chuck Mornings’ Ty Bentli, Kelly Ford and Chuck Wicks, as well as NASH Nights Live co-hosts Shawn Parr and Elaina Smith, the annual Broadway street-party will also feature performances from country music’s finest, including Terri Clark, Darryl Worley, Montgomery Gentry, John Stone, Anthony Orio, Scott Collier and more to be announced! Tootsie’s Orchid Lounge Annual Birthday Bash attracts some of the biggest stars in music, including surprise appearances. The event, which takes place Oct. 10th on Broadway between 4th and 5th Avenue, will host entertainment on an outdoor stage throughout the day and is FREE to the public. Today, Tootsie’s Orchid Lounge is a must-see Music City destination for tourists and is frequented by locals, including some of the biggest names in country music, who often drop in and surprise patrons with impromptu performances. Kenny Chesney with classic rock icon Steve Miller, Keith Urban, Kix Brooks, Montgomery Gentry, Kid Rock, Steven Tyler, Randy Houser, Jamey Johnson, Dierks Bentley and Hank Williams, Jr. are among the artists who have recently performed there. For additional information, visit www.tootsies.net.